Originally published in 1947, Stratego has been published in many editions since. It is a classic two-player strategy game. Here are resources for players of the board game Stratego. Two players each place their flag, bombs, and troops on the battlefield without knowing where his opponent is placing his. Once the armies are in place, players take turns advancing their men. Stratego is a cat-and-mouse game of epic proportions. Stratego is a classic board game by Milton Bradley, played on a 10x10 grid. Players each have an army of pieces with hidden values, which they move around to try to capture the flag of the other player. Here are the basic rules of Stratego. When it comes to setting up your board in Stratego, the position of your bombs should be a key consideration. Cleverly placed bombs can be devastating to an opponent by destroying their best pieces, or even guarantee you a victory if the opponent has no way to disarm them. Here are the general types of bomb placement options, and why you might want to use them. 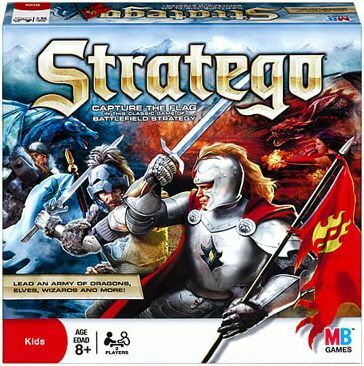 Stratego is a game played in two phases. The setup phase is much faster than the actual playing phase that follows, but it is just as important. One of the most crucial decisions you'll make is where to hide your flag. Here's a rundown of your options, and the pros and cons of each. There are several places to play the board game Stratego online, including some unofficial sites where you can play Stratego-like games with interesting twists. The goal is simple: capture your opponent's Command Center. One side plays with Boba Fett, Jango Fett, Darth Maul, Darth Vader, and the Emperor. The other side has Han Solo, Luke Skywalker, Anakin Skywalker, Princess Leia, and Yoda. Star Wars Stratego offers rules for four versions of play. How Should You Place Your Bombs in Stratego?